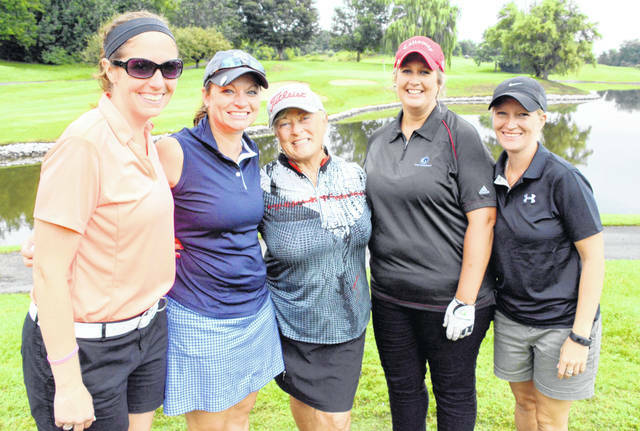 Sharon Sims is flanked by former members of her golf team, from left to right, Katie Shreck Clingner (Class of 2008), Stacey Rice Dorman (’06), Angela Santel Copsy (’07) and Amanda Wiesel (’08). A score of 15 under par won Wilmington College’s sixth annual Sharon Sims Alumni and Friends Scholarship Golf Outing Aug. 11 at Snow Hill Country Club, but the real winners are the students who will receive the Sims Scholarship. WC President Jim Reynolds thanked participants and other supporters of the annual benefit golf outing, saying it represented not only an enjoyable day on the golf course and chance for reconnecting with friends and former classmates/teammates, but also a fundraiser for a student scholarship fund. “Because of your generosity, we’ll be able to award two Sharon Sims Scholarships this year,” he said, noting this marks a special year for the event with the announcement that Sims will be among the 2018 inductees into the College’s Athletic Hall of Fame. A number of Sims’ former students and players attended the outing. Sims retired from the college in 2012 after 35 years as a faculty member in the health and physical education area, and coach of golf, women’s basketball and volleyball. The college will induct her into its Athletic Hall of Fame during Homecoming ceremonies Sept. 22. She expressed her appreciation for the 84 golfers and others who contributed to this year’s fundraising event. With a score of 55, the team comprised of Chris Cowman, Matt Carey, Greg Wilkinson and Grant Woods won a tiebreaker over the runner-up team of John Storrs, Steven Evans, Josh Newkirk and Joel Sims. Stacey Lunsford won the longest drive for the women while Tom Gronau captured the longest drive for the men. Bobby Henderson won the closest to the pin award and Steve Newby took home the longest putt made award. Nick Hoover won the drawing for a 50-inch television.